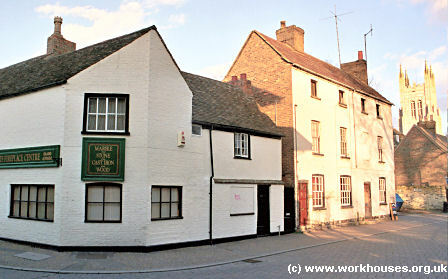 In 1719, workhouses were in operation at St Neots, Eaton Socon, and Kimbolton (Hitchcock, 1985). Great Paxton established one in 1729. A parliamentary report of 1777 recorded parish workhouses in operation at Buckden (for up to 16 inmates), Eynesbury (30), Hailweston (11), Kimbolton (35), Midlow (50), and Great Staughton (25). A small house at 2 Brook Street was once used as the St Neots parish poorhouse. St Neots former parish workhouse (centre of picture), 2004. County of Huntingdon: Abbotsley, Buckden, Great Catworth, Little Catworth, Diddington, Eynesbury, Graffham, Hail Weston, Kimbolton (2), Midloe, Offord Cluney, Offord Darcy, Great Paxton, Little Paxton, Southloe, St Neots (2), Great Staughton (2), Stow, Swineshead, Tetworth, Toseland, Waresley. County of Bedford: Dean, Eaton Socon (2), Little Barford, Little Staughton, Pertenhall, Shelton, Tillbrook. The population falling within the union at the 1831 census had been 16,360 with parishes ranging in size from Midloe (population 36) to St Neots itself (2,617). The average annual poor-rate expenditure for the period 1833-35 had been £14,059 or 17s.2d per head of the population. The St Neots Board of Guardians had difficulty in finding a suitable site for the erection of a new Union workhouse and the old parish workhouses in St Neots, Eaton Socon and Eynesbury continued in use for several years. 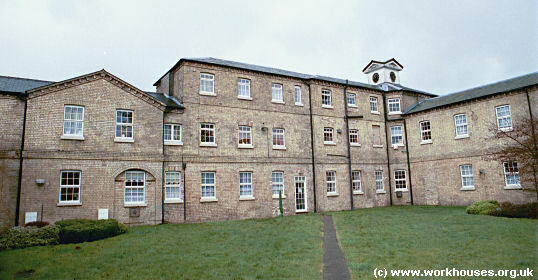 The new St Neots Union workhouse was eventually built in 1841-2 at Eaton Socon, St Neots. It was designed, without charge, by local architect William Abbot and was based on the popular cruciform or "square" plan. Its location and layout are shown on the 1901 map below. St Neots workhouse site, 1901. The entrance block had a three-story central portion with single-storey wings to each side. To the rear, a central two-storey range connects to the three-storey main accommodation block. To keep down costs, its capacity was reduced from the original planned 310 down to 250. In addition, no paving-stones or iron railings were incorporated, and at one stage, only one lavatory was provided. However, soon after its opening, these shortcomings were remedied with the addition of a perimeter hedge, clock, and additional privies behind the original infirmary block. St Neots general view from the south-east, 2001. St Neots main accommodation block from the south-west, 2001. A new separate infirmary existed by 1878. St Neots infirmary block from the south-east, 2001. The main building, later used as a veterinary centre for horses, is now known as the White House and used as residential accommodation. The former infirmary, also now a residential property, stands on Linclare Place. Cambridge Archives and Local Studies, Box SH 1009, Shire Hall, Castle Hill, Cambridge CB3 0AP. Holdings include Guardians' minutes (1894-1930); Births (1915-42); Deaths (1915-52); Creed register (1894-1930); Punishment book (1914-45); etc. FG Emmisson (1933), The Relief of the Poor at Eaton Socon, 1706-1834) (Bedfordshire Historical Record Society, XV).